One of my favorite modifications that I've made to my Cruiser has been getting rid of the rear derailleur. I exchanged the rear derailleur and cassette gears with a new wheel built with an internal transmission. The main advantage of an internal hub transmission is super smooth shipping and the ability to shift when stopped. 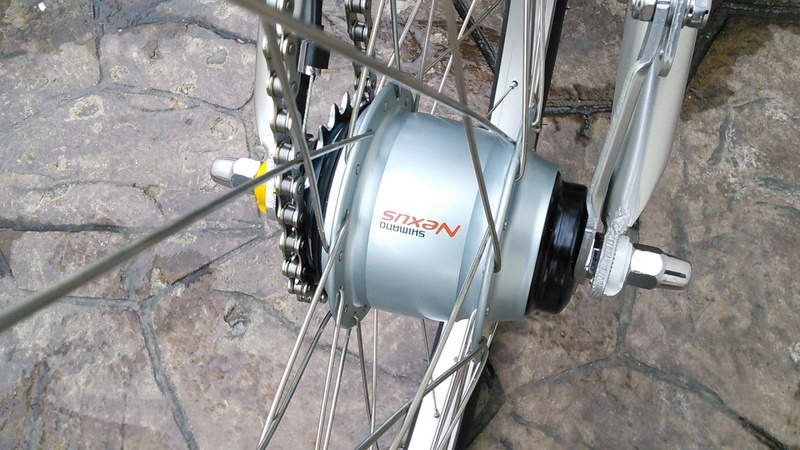 One of my favorite internal hubs is the "red-band" Shimano Nexus 8-speed hub. I recommend the Nexus Premium Version hub for it's gear range and high efficiency. 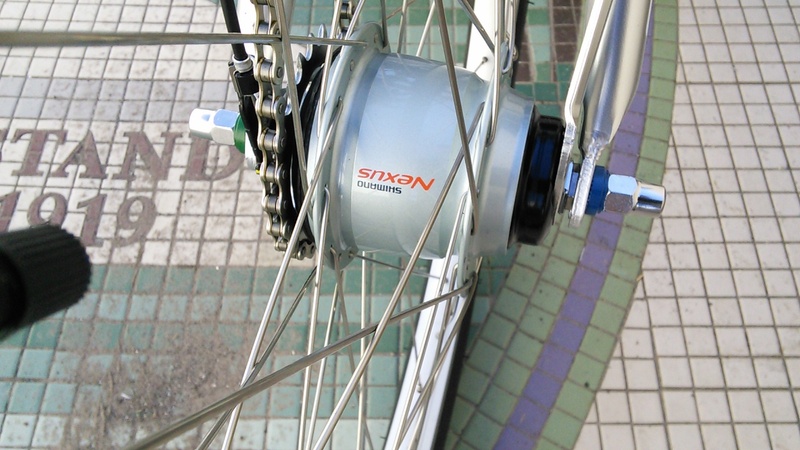 Instead of multiple sprockets and external shifter, the Nexus Inter-8 internal hub has just one sprocket and an internal shifter that locks various internal planetary gears. The gear range is determined by the number of teeth on the sprocket and the size of the wheel. I decided to choose my rear sprocket size based on the gear that I normally spend my time in, instead of trying to match my old gear ratios. The reason I did this is because the hub transmission is most efficient in 5th gear with a 1:1 ratio where the hub gets locked to the sprocket. According to my tests on the stock 11-34-tooth cassette I spent most of my time on the 20 and 17-tooth sprockets. For my initial setup I installed the 20-tooth sprocket. It was good enough to test the whole setup, but it was immediately obvious that this gear was too low. With the new wheel I had them send me a 20, 19, and 17-tooth sprocket. The 19 would be too close to 20 so I tried on the 17. I soon noticed that the 17t sprocked was too thick for my chain. They don't make standard sprockets that will fit the hub with less than 18 teeth for 3/32" chains. The smaller sprockets available are all for 1/8" chains. 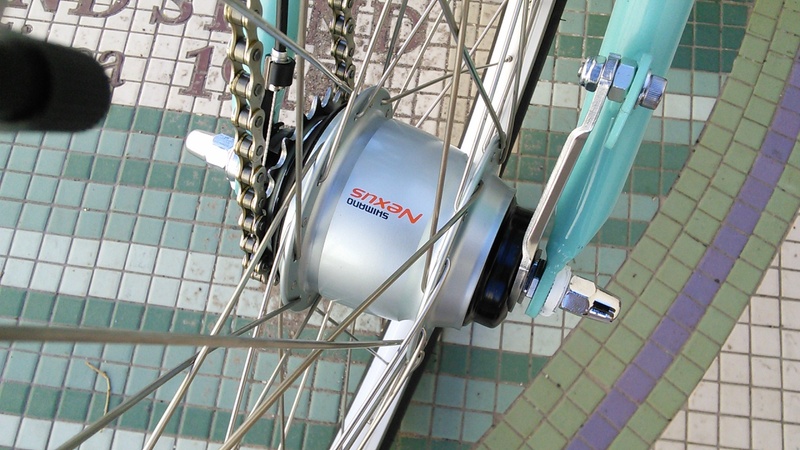 Normally the hub would be used with a larger wheel than 20", so the bigger sprockets would be ok. Since the Cruiser accomodates only a 20" wheel I decided to make the thicker 1/8" sprocket work with my 3/32" chain. So I used a table belt sander and milled 1/32" off the back side. After testing it for fitting the chain I attached it to the hub. The size of the 17t sprocket is enough smaller than the 20t that I needed to pull off another link of chain. Since I have a Schlumpf HSD on the front of this trike, everything fits perfect and I don't need a chain tensioner. Minor adjustment can be made by adjusting the idler position on the TerraCycle rear Idler kit. Riding with the Nexus hub and my new 17t sprocket have been great. Just as planned, I spend most of my time in 5th gear. Shifting is super smooth and almost imperceptable except for 5th gear where I can feel the click of the gears locking to give me the 1:1 ratio. I am very happy with the performance of the internal hub. The gear ratios I get are perfect for my riding style, so I don't think I'll need to tweak the gear ratios any time soon. In 5th gear (using the Schlumpf HSD overdrive in front) I ride comfortably at 20 mph in 5th gear keeping an 85rpm cadence. On flat terrain this is my usual cruising speed. Overall, I am very pleased with the combination of the Schlumpf High-Speed Drive and the Nexus 8 Hub in the back. According to Sheldon Brown's calculator I have a combination of about 15-120 gear inches with only one overlapping gear ratio giving me 15 usable gear combinations. This should be enough to climb about any hill and go as fast as I want to. The nicest feature of the internal hub is that you can shift at any time, even when completely stopped. When I ride with other riders they are amazed at how I don't need to downshift when I go to a stop. If you spend a lot of time riding in stop-and-go traffic the Nexus is a much faster way to ride.